The first time I walked into a butcher shop I felt completely out of my element. Navigating the meat case was and can still be intimidating at times. To understand the meat case at a butcher shop or supermarket, you must first understand the different cuts of meat. There are three top grades of beef to consider when choosing a steak or roast. Prime, Choice, and Select. 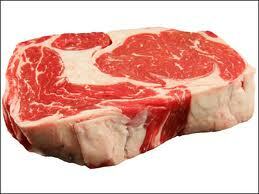 The grades are based on the age of the cattle and the degree of marbling of fat. “Prime” graded meats are the most expensive cuts. You will not find prime graded beef in the grocery store as they are almost exclusively sold to restaurants and hotels. Prime cuts are produced from young well fed cattle. 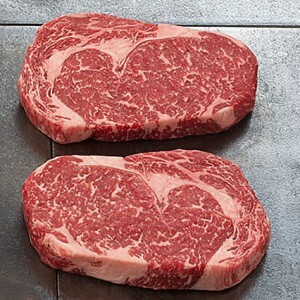 The greater the marbling of fat the more flavorful, tender and juicy the cut of meat. 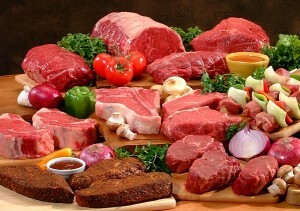 “Choice” graded meats has less marbling but are still tender, juicy and flavorful as long as they are not over cooked. “Select” is the third common grade of meat. It is leaner than the prime and choice with significantly less marbling. The lack of fat means less juice but a much lower price. You can save money by purchasing a USDA Select grade cut and marinating before cooking to obtain the maximum flavor and tenderness. So how do you know the Choice meat in the supermarket is really what the label says? Unlike the vibrant white ribbons of fat in Prime and Choice meats Select or commercial grade (or lower grade) meats appear darker and the fat has an oily or more yellowish appearance. 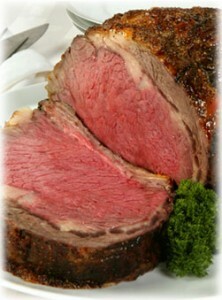 The first cut of meat behind the head is the shoulder, known as Chuck. This section of the cow although flavorful is fairly tough and fatty requiring a slow cooking method (preferably in a liquid) to break down the fibers. Chuck steaks and roasts (chuck blade, chuck fillet, under blade, top blade and roasts) are the least expensive cuts of meat and well worth the price if cooked properly. For blade steaks be sure to marinade or braise well overnight before grilling. Cook stew meat and roasts slowly in liquid. The Brisket is located below the Chuck. This is a very course meat as it surrounds the sternum. Ideally Brisket should be smoked slowly to soften the stringy fibers. Corned beef is brisket that has been cured in a salt brine. The meat from the middle area of the cow is tender and well marbled with large pockets of fat making steaks juicy and full of flavor. 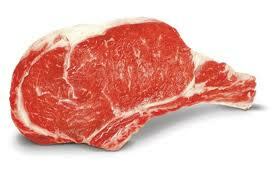 Rib Steak: a prime rib cut into individual steaks. The rib steak has the bone attached while the rib eye steak the bone is removed. Without the extra ripples of fat the short loin steak is less tender than a rib eye. The Tenderloin: Tenderloin steaks are tender but pricey and the flavor is pretty mild. The thickest part of the tenderloin is known as chateaubriand. The meat behind the chateaubriand is the popular Filet mignon. 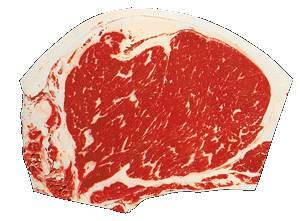 T-bone Steak: The last steak cut from the tenderloin is known for the t-shape bone that runs down the middle. The T-bone has a little of both the short loin and the tenderloin. 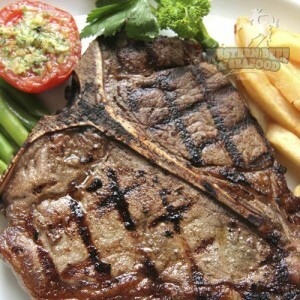 The porterhouse is a t-bone steak with a bigger portion of tenderloin attached. The sirloin comprised of the cow’s hip. Sirloin steaks are large and thin. The most well-known is the tri-tip. Sirloin steaks and ground sirloin are leaner making them a better pick if you are watching your fat. 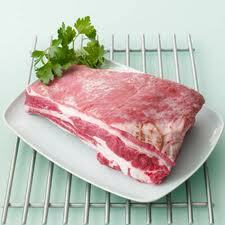 Flank Steak: Directly below the loin and sirloin, on the underside of the cow’s belly, is the flank. 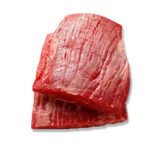 Flank steak is a thin, wide, boneless cut. Flank steaks are offen used when making Fajitas. Cook them very quickly to medium-rare and slice thinly against the grain.